"He has achieved success who has lived well, laughed often, and loved much". Cole Pittman accomplishments remind all Longhorns that In sports and far beyond, his contributions to Longhorn heritage have shaped the present and empowered the future. Article below is written by shalliburton@statesman.com. The Images are added by Billy Dale. Marc Pittman (Cole's father )will leave his home in Shreveport, La., this morning to honor an anniversary. He'll pick up some fried chicken — his oldest son's favorite — maybe a bouquet of flowers, and then drive 45 miles to the tiny town of Dubberly, La. As he does every Feb. 26, the father will have lunch with his oldest son, Cole Pittman, the former Texas Longhorns defensive tackle who came to UT in 1999 as one of coach Mack Brown's prized recruits. Cole died in a one-car accident. He is buried near other Pittmans, including his grandparents, two aunts and an uncle, at Fellowship Cemetery, an area tucked away in the muffled quiet of the pine and oak trees off of State Road 531. His headstone is engraved with the century-old words of poet Bessie Stanley: "He has achieved success who has lived well, laughed often and loved much whose life was an inspiration, whose memory is a benediction." At the foot of the grave is a smaller stone marker, with the words "My son, my son, my son," what Marc kept repeating in amazement after his wife, Judy, gave birth to Cole. At 6 feet 6 inches, Marc Pittman is a bear of a man. He will sit near the marble headstone, eat the chicken and talk to his oldest boy, the one he kissed, hugged and prayed with 10 years ago today. That was the last time he talked to his child, before sending him back to school in Austin. Usually, he does the father-son talking at home in Shreveport. Today merely brings a change in venue. He visits the cemetery at least twice a year — on Cole's birthday in January, then a month later to commemorate the day he died. When Cole was alive, the conversations, dubbed the "I love you" calls, came nightly at 9:30 p.m.
"I have a picture of him in my den," Marc Pittman says of Cole. "It's about 14 by 20. The first thing I do every morning is kiss that picture. Then I hit my knees and pray." Cole Pittman, who liked to hunt, fish and play practical jokes on his teammates, was popular at UT and on the verge of starting for a team that eventually finished a field goal away from playing for a national title. "He was like a little kid," says Chance Mock, Pittman's best friend at UT. "He took such joy in the little things." Although no records are kept, Pittman is believed to be the fifth Longhorns athlete to die while still competing for the school. Marc Pittman ended his last conversation with Cole with a prayer, quoting First Chronicles 4:10. Then he told him to drive safely back to Austin. Cole Pittman never arrived for his first class or the opening day of spring workouts. He had planned to spend that weekend with Mock, then a redshirt freshman quarterback who had invited him to see Kenny Chesney in concert at the Houston Livestock Show and Rodeo. But Cole canceled at the last minute. "He told me he just needed to go home and see his family," Mock recalled this week. "I think he had a sixth sense." Pittman called Mock that Sunday to tell him he was staying an extra night in Shreveport. He woke up early Monday, loaded his red Chevy pickup and left for Austin before sunrise. A receipt the family found in his wallet showed that Cole stopped briefly, picking up a muffin and orange juice in Palestine about 6:30 a.m. Then an hour or so later, he apparently fell asleep at the wheel — or maybe swerved to avoid an animal in the road, no one knows for sure — somewhere between Easterly and Franklin. He failed to negotiate a slight bend on U.S. 79. The truck, traveling at a high rate of speed, hit a guardrail, flipped and landed upside down in a creek bed. Time of death was thought to be about 7:45 a.m., but Cole's family in Louisiana and his friends, coaches and teammates in Austin didn't know what had happened to him for more than six hours. About 10 minutes after the accident, a passer-by called police in Easterly to tell them he'd seen a truck leave the road. Officers couldn't immediately find Cole's identification, but they did notice he was wearing a Longhorns ring. One of them called a friend who had worked in Brown's game-day security detail. That's how Brown learned the news, minutes before he was scheduled to meet with his Longhorns, who had gathered in the team meeting room at the Moncrief-Neuhaus Athletic Center. Marc Pittman called Brown and pleaded with him: "Tell me my boy is with you." Brown, sobbing, said, "I can't do that." Stevie Lee and Phillip Geiggar, teammates of Pittman's at Evangel Christian Academy, were pulled from the meeting with no explanation. They were taken to a room with then-assistant coach Darryl Drake, Brown's wife, Sally, and Jean Bryant, an academic adviser. Drake broke the news. "I couldn't believe it," recalled Lee, a burly defensive tackle who now works in Austin real estate and is married with two young daughters. "I dropped everything I had in my hand," Lee said. "It was a surreal moment. The first thing I wanted to do was call my momma. That's what I did." Brown told the rest of the team. Mock left the meeting immediately, telling the coaches he didn't believe the news. "Mack was standing in front of 90 something guys and just told them that they had lost their brother," recalled Nathan Kasper, now a helicopter pilot in the Navy. "A lot of really tough guys were in that room crying like babies. "(Coach Brown) told us not to go anywhere alone, and to stay in groups with each other and to take care of each other. We filed out, and most everyone went to Cole's locker. Nobody organized a prayer, but we were all looking at his locker with his picture on it the same as it was a few minutes ago, and we wondered how he could not be walking through that door any second. "One teammate was leaning with his head against the wall gently pounding the bricks. ... Others just stood arm in arm in a giant huddle. A few took off, unable to accept what we had been told." There was a funeral in Shreveport. It was in the same church where Cole had announced his pledge to Texas two years earlier. Back in Austin, the team gathered for a memorial service with the Pittman family at the 50-yard line at Royal-Memorial Stadium, watching as a photo of Cole flashed on the video board. They walked as a group to the service at Bass Concert Hall, across the street from the stadium. Seven months later, the team dedicated its second home game of the season, against North Carolina, to Pittman's memory. They wore orange and black decals on their helmets, featuring Cole's initials and No. 44. It was as if Cole was directing the action. Nathan Vasher scored a touchdown on a 44-yard punt return. Defensive end Cory Redding, a pallbearer at Pittman's funeral, also scored a touchdown on a rare interception. As the score surged, Chance Mock realized there was a chance the Longhorns would hit 44 points, and he started pestering Brown and other players. The score hit 44-14 with 36 seconds to go. Major Applewhite, the holder on extra points, took a knee so that the score would forever stay at 44. Life has gone on for Pittman's family and friends , and the football booster club at Evangel Christian Academy is hopeful that the 6,400 square-foot Cole Pittman Memorial Field House will be built by fall if enough funds can be raised. Cole's brother Chase signed with Texas in 2003, but because of the painful memories, he left UT for Louisiana State. He played two seasons with the NFL's Cleveland Browns and now works for his father. Days after Cole's death, his fiancée realized she was pregnant. Marc and Judy Pittman have a 9-year-old granddaughter, Payton, who has Cole's sapphire blue eyes. Marc Pittman estimates that his son's story inspired at least a dozen fathers to name their sons Cole. That group includes Kasper, who called Marc Pittman in 2003 to ask permission to use the name. Chase Pittman and his wife became parents for the first time in October with the birth of son Phoenix Cole Pittman. "He's the happiest baby alive," Marc Pittman said of his first grandson. Perhaps most important, Cole Pittman inspired a large group of men, from his teammates to his coaches to people he never met, to remember to say "I love you." "You realize how important family is," Brown said this week. "You never want to close a day without saying all that you needed to in a conversation with a loved one. "I call my kids more, and I never fail to tell them that I love them. Cole's death was a reminder to all of us that we have a short time here on Earth, and we never know when that time may end. So you had better live life to the fullest." Marc Pittman is the owner of a construction firm in Shreveport, LA where he lives with his wife Annette and his son Chase, a freshman football player at the University of Texas. He dedicates much of his time to speaking locally and nationally about his relationship with his sons. Mark Wangrin is a senior write at the San Antonio Express-News covering Texas sports. His work has appeared in Sports Illustrated, the New York Times, and many other publications. Almost a decade ago, Marc Pittman placed a cross at the bend of the road on U.S. 79 to mark where his son lost his life. He maintains the cross, but said the sunlight turned it burnt orange. 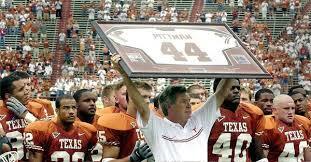 The University of Texas has established a scholarship in the name of Cole Pittman. The first $25,000 contribution was made by UT Men's and Women's Athletics. Friends are asked to direct contributions to the Longhorn Foundation, P.O. Box 7399, Austin, TX 78713. Please make contributions payable to The University of Texas. 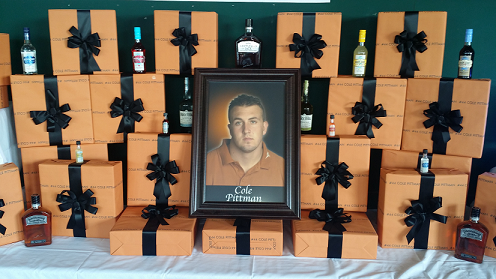 To date, $42,593 has been raised for the Cole Pittman Scholarship Fund.